Shelton, CT, May, 2017 – Centrix Dental names a new Regional Account Manager in field sales, Nicholas Campbell. Nick will support our extensive network of dental office customers and Centrix preferred dealers in the Southeast. 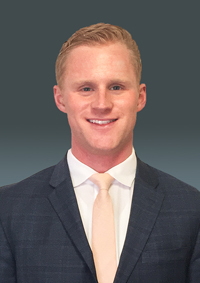 Nick is a former territory sales representative for Benco Dental, charged with building new doctor relationships, practice management consulting and new product education and adoption in the Southeast. Prior to working at Benco, Nick was a tech entrepreneur, co-founding Bonfire Ventures as part of the College of Charleston's Interdisciplinary Center for Applied Technology (ICAT) program. ICAT is a tech and media business incubator open to a select group of students with product concepts seeking investors/funding. While at school, Nick was also a Division 1 scholarship athlete, devoting 40+ hours per week to that commitment. We welcome Nick's unique set of sales skills to Centrix. He is excited about new and disruptive dental technologies from an entrepreneurial perspective, but he is also a firm believer in hard work and building meaningful customer relationships. He looks forward to joining the Centrix sales team and working with offices and dealers to improve the lives of clinicians and patients alike. For product sales and support in the Southeast, please contact Nick directly to find out all the ways Centrix is Making Dentistry Easier. Nick can be reached any time at 404.263.1590 or via email at ncampbell@centrixdental.com.